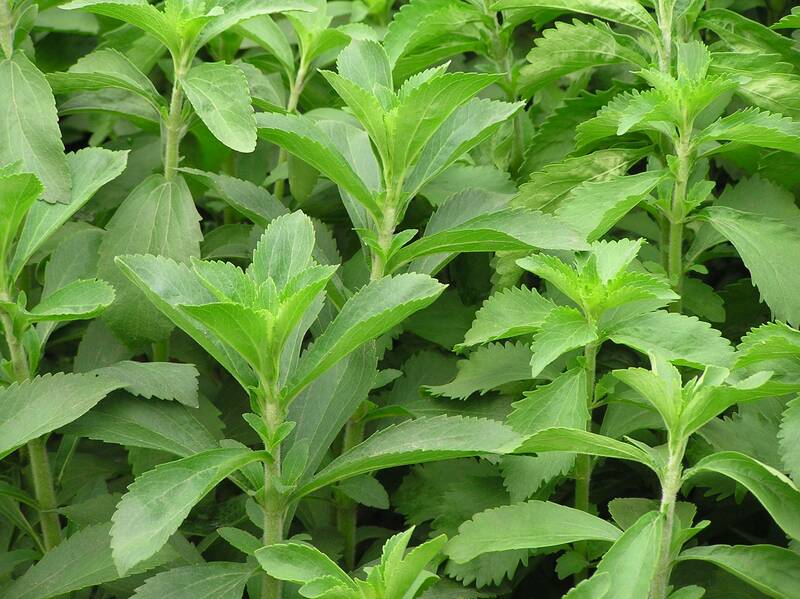 Stevia rebaudiana commonly known as sweet leaf, sugar leaf, or simply stevia is a native subtropical plant from South America (Brazil and Paraguay). It stands well on a sunny or lightly shadowed spot .The more sun it gets, the sweeter the plant is. This perennial plant can reach the height of about 60/80 cm if she doesn’t get cut. Good passing ground and a spot that is not too wet are sufficient. The leaf reaches a length of about 2,5 to 3 cm and its colour is fresh green. From April on the plant will grow again, and this growing continues until the end of October. During the growing season you can cut the leaf off the plant several times to your heart's content . In autumn the stevia will blossom. The main thing of the stevia is the leaf. This is used as a replacement of sugar, because the leaf contains a lot of sweeteners. The plant has been used centuries by the Guarani Indians to sweeten their foods and drinks. We use the plant as sugar substitute. The Indians also used it to heal skin diseases like eczema, dermatitis etc. .
To indicate how sweet the leaf of the Stevia rebaudiana is; a healthy fresh leaf of stevia can be about 40 times sweeter than normal sugar or saccharine. The sweet taste derives from the glycoside in the leaf, this vegetable substances give the leaf the sweet taste. The leaf can thus be used fresh, but it can also serve as a sweetener in dried form just fine. Stevia is popular and is commonly used by people with hyperglycaemia and diabetes, at the same time it appears to lower the blood pressure. Stevia contains no calories in contrast to sugar and it causes no tooth decay. At for example Coca-Cola the stevia extract (glycoside) is used as sweetener. You can use the plant as a tub plant and winter it frost proof at a possibly cool spot, or get it inside a room where there will not be stoked. In the full ground the winter hardness is maximum zone 8a -10/-12ºC (in case the roots do not freeze in the winter, the plant will return in spring).